Within this session we are going to focus on keeping the ball in a range of circumstances, we look nervous sometimes within a game and we need to go into our matches on Friday and Saturday being confident and strong and still keeping the shifting and switch play in from previous sessions. 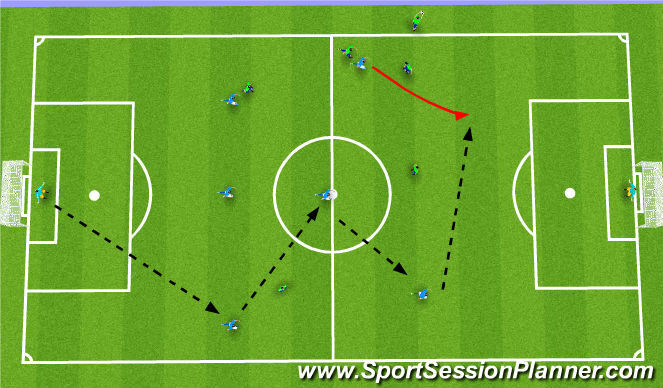 Within this warm up, players will be in a 4 vs 2 situations. and there are two boxes, one is a play box and the other is a reflection box. 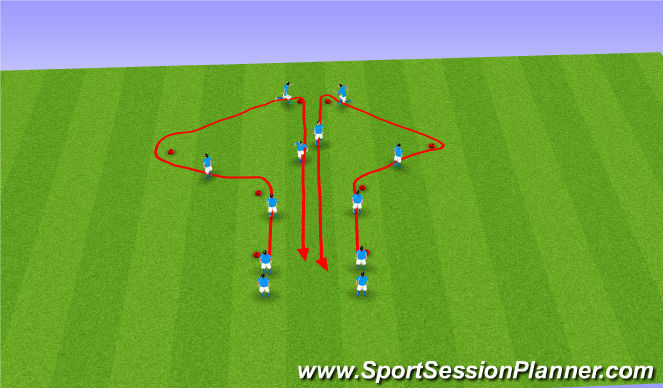 Players will play and try to keep possession with a coloured bib in their hands if the defender (one of the two) win the ball the person that lost the ball will then swap bibs and enter the reflection area where they will be a ball and they will reflect on what they did wrong. They will work within the channel doing skills and tricks and when they go there and back they are back in the game so what was a 4vs 1 goes back to a 4 vs 2 where more pressure should be added. Within the first whole allow players to organise themselves and take leadership within the games, look for them to choose their own positions and let them become comfortable with their teammates. Planning for 7 vs 7 and don't apply an overload within this whole. 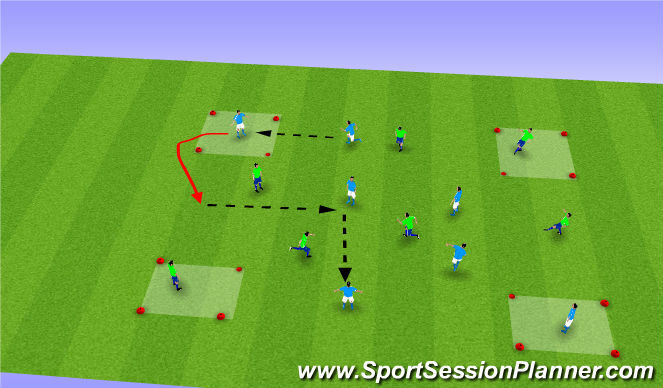 - Looking at the size of the field how can we shift the ball effectively? - Once received the ball can we look to drive, shoot or pass? The area is set up with 4 boxes containing 3 cones and 1 flat marker each. Players will be expected to use these boxes and exit different sides of the area. Inside the area players will be passing the ball around trying to retain the possession of the ball on their teams. 5 vs 5 within the middle section. Teams will try to play to their own colour player in the box, each team should have two. 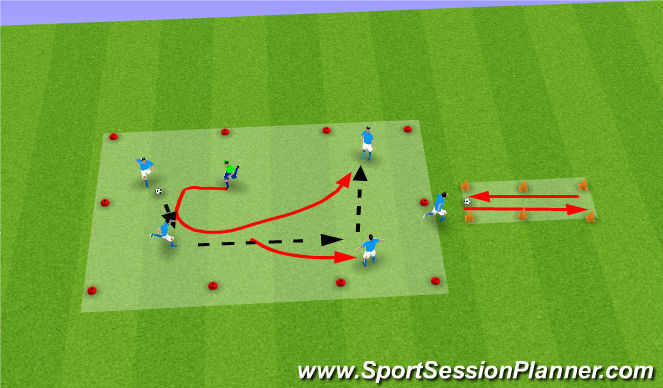 Players will be shifting the ball to the players in the boxes where to start they will receive and look to play straight back, later on get players to receive and play through another side of the cone and look for the person that passed it in to full into the position in the box. - Can we play on our first touch or second? Moving into this 2nd whole we are going to focus on retaining the ball and it is massively important that the keepers involved in this process and they become the extra defender. Cad the team of formation 1,2,2,1 look to spread the ball easily and can we allow that diamond shape we have in midfield to be effective. Players will be in a cool down where were gonna brainstorm ideas of what we've learnt today, this involves jogging, sprinting, streches and allow time to lower heart rate and also get feedback on the session.